This driver offering from Callaway employs a myriad of their technical features including Fusion Technology (FT), a combination of a carbon-composite body with a titanium face cup, and Hyperbolic Face Technology. There is a lot going on with this driver, and I'm sure Callaway has spent millions of dollars and countless hours developing them. The bottom line though is -- what will it do for me? This is a driver designed for the better player; someone who can and does "shape" their shots. The composite body means low overall weight (for greater swing speed more distance). The Hyperbolic Face Technology is engineering to improve ball speeds across the entire face -- this translates to better performance, even on mishits. Available in either a Regular or Stiff flex shaft, the left-handed version only comes with the 10-degree face (9 and 11-degree options are also available for right-handed players). As a lefty golfer, your options are always going to be limited, and this club is no exception. The 10-degree model is a solid performer, however, and should definitely get consideration from those looking for a good option in the titanium driver category. 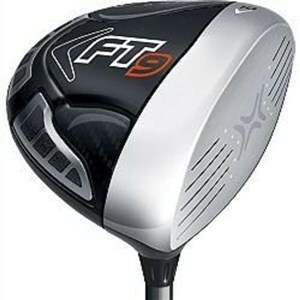 Aesthetically, Callaway makes some of the most handsome clubs on the market, and the FT-9 gets high marks here as well. The FT-9 just looks like it will hit the ball a long way; the silver titanium face sharply contrasts with the black composite body and the bold white markings. It's an aggressive yet clean-looking golf club.